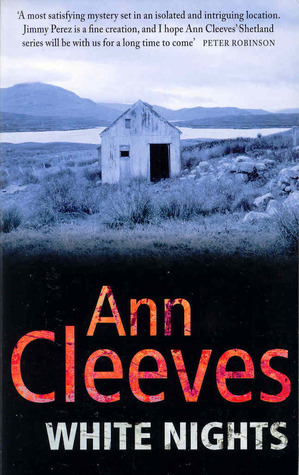 White Nights by Ann Cleeves is the second in her Shetland Quartet, featuring Detective Jimmy Perez. The first book is Raven Black, which I read and wrote about last year. I enjoyed this one just as much as the first and, although I think it stands well on its own, I think it best to read them in order as some of the characters appear in both and you can follow the development of their relationships. White Nights is set mainly in Biddista, a fictional village of a few houses, a shop, an art gallery and restaurant called the Herring House, and an old Manse. Kenny Thomson finds a man’s body hanging in the hut where the boat owners of the village of Biddista keep their lines and pots. Perez recognises the dead man – he’s the mystery man who had caused a scene the previous evening at the opening of Bella Sinclair’s and Fran Hunter’s art exhibition. At first it looks as though the man, his face covered by a clown’s mask, has committed suicide, but he’d been dead before he was strung up and the murder team from Inverness, headed up by Roy Taylor, are called in. It takes quite some time before they can identify the dead man and even longer before the motive for killing him is revealed. And that is only after more deaths have occurred. This is a most satisfying book for me. It’s not only full of believable characters, each one an individual in their own right, it also has a nicely complicated plot and a great sense of location. As well as the mystery of who killed the man in the clown mask and why, there is also the disappearance 15 years earlier of Kenny’s older brother Lawrence. It was thought that he left the island after Bella had broken his heart. Kenny hadn’t heard from him since and at first thought the dead man could be him. I could see the landscape and the sea, and I could hear the birds, the kittiwakes on the cliffs, the puffins and skuas. The Shetland Islands are part of theBritish Isles, but are so far north of the mainland that they are on about the same latitude as the southern point of Greenland. However, I did think that the ending came rather suddenly after the careful build up to the mystery. The tension just gradually faded away as it became obvious who the culprit was. But I still think it’s a very good book, that held my interest, one that made me want to get back to it each time I had to put it down. This is a series I’ve been meaning to read for ages. I think I probably said that last year when you wrote about the first one too! Maybe in 2012 I will get round to the first … Great review. A great start to your bookish travels. I too thoroughly enjoyed White Nights for all the same reasons you did… so evocative of place etc. I did guess who did it very early on but it didn’t spoil my enjoyment at all. I must get to book three sometime. Cath, I didn’t guess the culprit until later in the book. I’m hoping to find a copy of Red Bones soon. Margot, I really like the Jimmy Perez character too! This is a series I have been meaning to start. I love your review. It’s going on my TBR. the Shetland Quartet is one of my favorite little series..I loved all four. I must look out for this one. I read Raven Black last year after you read it and I planned to follow the series, but this one never seems to be on the shelf in the library at the right time. This series is extraordinarily good and the setting so appealing! Though it started out as a quartet, I have heard that Cleeves has promised more Jimmy Perez mysteries.